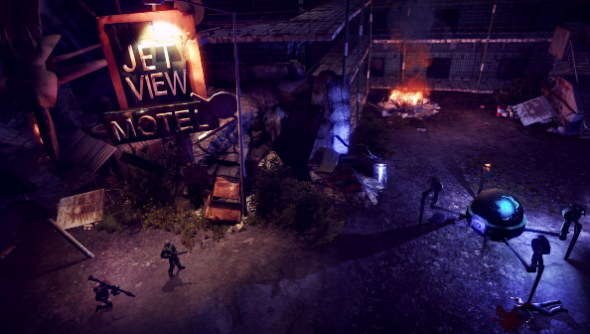 Kickstarter success story Wasteland 2 has a new in-game screenshot for you to enjoy. Developer inXile Entertainment has released the new screen alongside two superb character portraits. The in-engine screenshot shows off Damonta, a trading town just off the road from Damonta Air Force Base. The town boasts a booming scrap trade due to the decrepit aircraft at the base, as well as some great motels, diners and a top notch classic radio station. It’s strictly a winter-season visit though; in summer things get a little sticky due to the intense radiation clouds. Along with the screenshot, inXile published two new pieces of character art on their Kickstarter update, which shows off a pretty ragged looking wasteland survivor, along with a Ranger who seems to have taken better care of himself.